Another shy chap, our Charles writes for Waterlog, Gray’s Sporting Journal and a magazine called The Field, which must be quite good, if it has attracted Waterlog writers onto its staff. 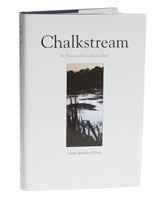 Chalkstream is an anthology of writing that spans every mood of England’s chalkstreams and quite a few of France’s. The maps alone are worth the price of the book and will be an eye-opener to anglers who believe that these waters begin and end in Wessex – there are 218 on the list, spread in a great arc from the south-eastern tributaries of the Derwent to the hinterland of Dorchester, and there are a great many stories to go with them. What makes this book special is the way the author has selected stories to illustrate each watershed and every major river, so the reader gets a broad perspective of chalkstreams across the length and breadth of the land. Best of all, the stories aren’t from the usual sources, so even if you are familiar with the literature, there are some real treats to be found here.